Aren't you tired of writing stored procedures for SQL Server tables that your application needs to have access to? Don't you wish that there is a tool out there that will magically generate the Insert, Select, Update, and Delete stored procedure scripts for you by simply right-clicking on a database or table? Look no further! 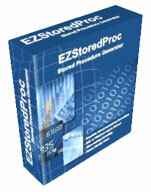 EZStoredProc (pronounced as "Easy Stored Proc") is that magical tool. Unlike the clumsy wizard provided by MS SQL Server Enterprise Manager, EZStoredProc does not add a number to the end of every parameter of the generated stored procedure. It is a lot smarter in handling primary key, composite keys, and identity column. It does not generate a stored procedure that passes in duplicate parameters when you have both primary key and identity field as the same column. It is a lot more powerful and flexible because it provides many options for you to format and tweak your stored procedures. Simply right-click to generate stored procedures for databases and tables. Execute stored procedure script against your database directly from EZStoredProc. Option to use identity field and/or primary key fields in Where clause. Generate Insert, Select, Update, and Delete stored procedures. Generate "Grant Execute" statement for each stored procedure. Return identity value (if identity field exists) from table. Allow flexible formatting and naming of stored procedures. Support either Windows Login or SQL Server Login. For a complete documentation on how to make EZStoredProc perform its magic, please click on the User's Guide link. You can also view the complete screen shots and instructions on how to install and run EZStoredProc there. EZStoredProc has a relatively small installation zip file (only 0.48 MB in file size), it can be downloaded quickly from our Download page. EZStoredProc runs on Windows 98, ME, NT 4.0, 2000, XP, Vista, 7, and 8. The unregistered version of EZStoredProc allows you to generate and view the stored procedure script. You will not be able to execute or copy the script. If you would like to purchase a license after trying it, you can make your purchase by clicking on the Buy Now link. Our license is issued on a per-computer basis. You will need one license for each computer that you install EZStoredProc on. You will also get unlimited e-mail tech support when you purchase a license from us. Do not forget to read testimonials from our customers who	used the product before.